I light this candle in my office every day. It smells like food baking with spices. Everyone comments on its loveliness. My theme today: be thankful. Yesterday, I made a pot of Good Earth tea in my classroom — the warm, comforting cinnamon spice aroma wafted through the entire classroom and surrounding hall area — now, I need to get to the store for more because the students are asking for it today and I’m out (one 9th grade boy whispered to me that it was the best tea he’d ever had 😉 ). Ah, home-style comforts in a high school room — I am thankful. Wow! What a difference in classroom smells. I’ll just say that my classroom smelled like skunk today and the teacher yelled at the students for bringing that odor in with them. 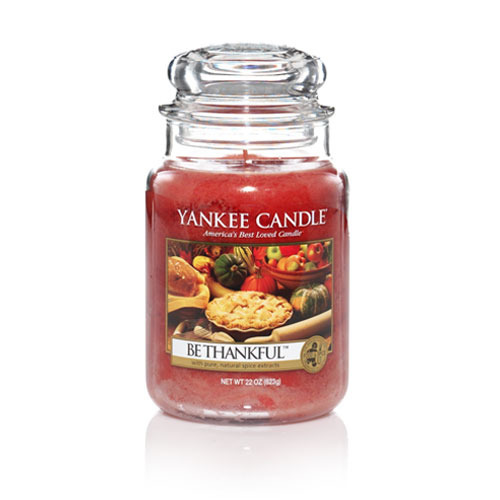 And the “Be Thankful” candle–I have never seen this one, but that’s probably because I have too many candles already and haven’t bought any of late….but you make me want to!!! It’s awfully cold and rainy here today. Time to watch a movie, read, and light some fall candles. pumpkin spice candles. our fall must-have!! !